According to the American College of Prosthodontists, nearly 178 million Americans are missing at least one tooth, and that includes 35 million people who don’t have any teeth. While missing teeth might seem like just a cosmetic issue, they can actually cause a variety of serious dental problems. Often, the remaining teeth will drift into the open spaces, causing them to become crooked and crowded. Also, the exposed gum tissue is more likely to develop gum disease, which in itself is one of the leading causes of tooth loss in adults. All in all, tooth loss often causes even more tooth loss, and while other restorative treatments can help replace the teeth in an aesthetic sense, they do very little to prevent the tissue and bone atrophy that can cause the real, long term damage. 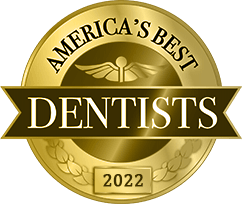 However, Long Island's best dental implant dentist, Dr. Allan S. Mohr, can now offer a predictable solution that is secure, long-lasting and natural-looking. That solution: dental implants. Security: Dental implants actually replace your teeth from root to crown and rebuild a base almost exactly like your natural teeth. This means, unlike other treatments, your new teeth will have the kind of support that will ensure once they are in your mouth, they won’t be going anywhere. 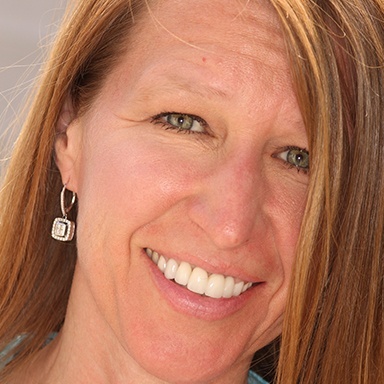 Longevity: Most other restorations last about 10 years or less, with dentures only lasting about 7. This means you’ll have to deal with faulty restorations before you finally replace them. Dental implants, on the other hand, can easily last for 30 years or more. Sustained Health: The root structure of your teeth play a vital role in supporting your jawbone. This not only makes it strong enough for you to chew confidently, but it also gives your jaw the ability to keep your other teeth in place. After this structure is lost, the jaw naturally begins to shrink. Dental implants are the only treatment that can prevent and even reverse this from happening, assuring a lifetime of consistent oral health. Aesthetics: Since your jaw will be supported by a renewed root structure, your face will appear fuller, younger, and you won’t have to deal with the sunken, elderly appearance we’re all familiar with. Plus, the replacement teeth used in conjunction with dental implants are primarily made of dental porcelain, which is able to completely replicate a natural tooth in shape, size, strength, color, and even feel. 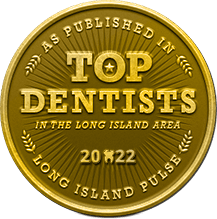 What Are Dental Implants on Long Island? At this point, after reading about these benefits, you probably don’t even care what they are, but we want you to know anyway. A dental implant is a small titanium post that is surgically placed into the jaw in order to recreate the root structure of a tooth. A dental prosthetic (replacement teeth) is then attached to this root to help completely fill in the gap in someone’s smile. The posts themselves are able to support a variety of prosthetics that can replace anything from a single tooth to an entire mouthful of teeth (more on this below). When it comes to giving you your smile back, nothing does it better or more completely than dental implants. They’re elegant in their simplicity, and the results are always dramatic and long-lasting. To get dental implants, you’ll first need to schedule a consultation with Dr. Mohr. After a brief examination and a review of your medical history, he’ll determine if you’re a good candidate for dental implants (more information about this in the FAQ below). Placement: This is a minor surgical procedure where a small incision will be made in your gums, and the implant post(s) will be precisely positioned into your jawbone. This part of the procedure will be performed by a local oral surgeon or periodontist* to ensure you only get the best results. Healing: You’ll then be given 4-6 months to heal. Your gums only need about a week or so to mend, so this period is mostly intended to allow your implants time to naturally bond to the surrounding bone. 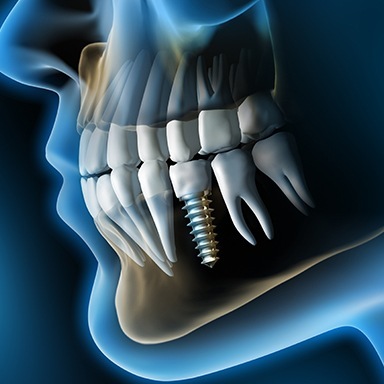 They are able to do this because titanium is biocompatible, and it’s just another reason why dental implants are the most secure tooth replacement option available today. Restoration: You’ll return to Dr. Mohr so he can fit you with your replacement teeth. 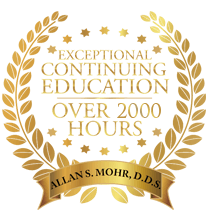 Dr. Allan Mohr has studied dental implants extensively, and this is why he knows it’s best to have the placement performed by a qualified oral surgeon or periodontist. 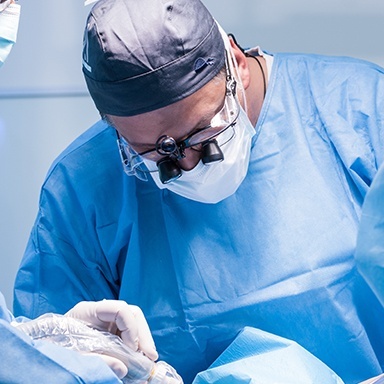 Oral surgeons and periodontists are specialists that have experience placing thousands of implants, and this is a big reason why they have a success rate of 95% and above. Dr. Mohr has a vast network of highly-experienced oral surgeons and periodontists that he has worked with for years, and he wouldn’t send any of his patients to them if he didn’t completely trust their work. Thanks to their particular expertise, your implant procedure will be successful, painless, and you’ll quickly be able to return to Dr. Mohr to have your final restorations placed. Single Tooth: We’ll place an all-porcelain dental crown onto the implant using a connector called an abutment. Dental porcelain, as we mentioned above, is extremely strong, and we’ll be able to shape it so that it looks and feels just like your other teeth. After a few days, we doubt that you’ll be able to notice the difference! o Implant-Retained Bridge: This can be used to replace a row of consecutive missing teeth. First, we’ll place implant-retained crowns (like we just mentioned) on either side of the gap in your smile, and these will be connected to prosthetic teeth that sit on top of your gums. Compared to traditional bridges, implant-retained bridges last longer, look natural, and don’t require healthy teeth to be filed down to hold the supporting crowns, better preserving your natural smile. o Implant-Retained Partial Denture: This can be used to replace teeth missing throughout the mouth. It will consist of a gum-colored base attached to prosthetic teeth, and rather than using metal clasps like traditional partials, it will be held in place using dental implants. This means they will never slip, they’ll fit better, and you won’t even have to take them out to clean them. o Implant-retained denture: Multiple posts (6-8 most of the time) can be used to support a full denture. They look just like other traditional dentures, but they’ll maintain their fit for much longer because your gums and jaw won’t be constantly shrinking and changing. Plus, because they are supported by implants — no denture adhesive is needed — and they allow for a much stronger bite force, enabling you to eat a wider variety of healthy foods. Often, the biggest problem associated with tooth loss is that it prevents a person from eating nutrient rich items such as meats and fibrous vegetables, creating a nutritional deficit that can shorten their life by up to a decade. With implant-retained dentures, you can eat whatever you like with confidence, whether that’s steak, an apple, or corn on the cob. o All-On-4 Dentures: This method is great for patients who may have a thin or brittle jawbone because it uses only 4 posts to support an entire full denture. Two are placed at the front of the jaw where the bone is naturally thicker, while two others are placed towards the back at an angle to help them provide maximum support. 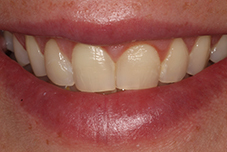 With this approach, often, the implants can be placed and restored in a single day! 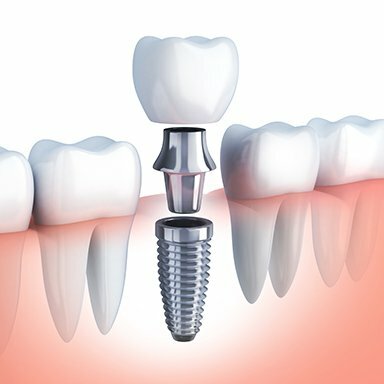 A dental implant is a small titanium post that is surgically placed into the jaw to recreate a lost tooth’s root structure. It is then attached to a variety of dental prosthetics that can replace a single tooth, multiple teeth, or an entire arch. 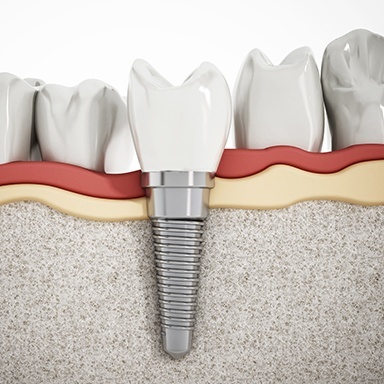 Are dental implants better than traditional crowns and bridges? Yes, and that’s because they last longer and provide the jaw essential support that these traditional methods simply can’t. Overall, they’re better for both your smile’s appearance and its health. This will be determined by Dr. Mohr during your initial consultation, but the main things he will be looking for are decent oral health, stable overall health, and an adequate amount of strong jawbone to support the implant posts. If a person does not have all 3 of these qualities, Dr. Mohr will refer you to a qualified oral surgeon or periodontist for the needed CT scan (3-dimensional x-ray) before beginning implant treatment. This can vary greatly from person to person. Many people can complete the entire process in less than 6 months, while more complicated cases can often take over a year. Dr. Mohr will be able to map out your particular treatment plan at your first appointment so you can get a better idea of your specific timeline. Of course, each of these will vary from person to person, and Dr. Mohr can give you specifics at your initial consultation. Many insurance plans have excellent coverage for dental implants, and we also accept financing from CareCredit and Lending Club. 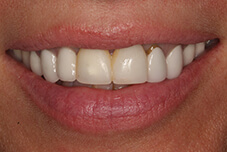 While dental implants may cost more upfront than other restorations, they will not need to be replaced nearly as often. Other treatments typically need to be completely replaced every 7-10 years, while dental implants can last many more years. When considering the long term, dental implants usually are the better financial and medical choice. When it comes to replacing your missing teeth, it’s easy to say, nothing does it better than dental implants. After reading all of this, we’re sure you agree! Dr. Mohr has helped thousands of patients get their smiles back with dental implants, and he can do the same for you. If you’re ready to stop living with missing teeth, he’s the doctor you can trust for guaranteed results. 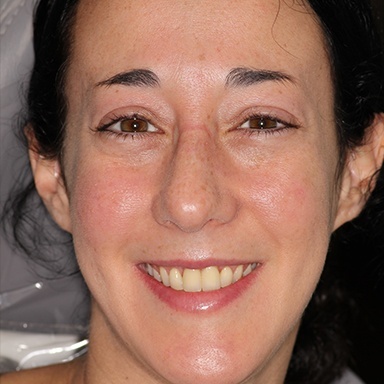 Explore our dental implant smile gallery to see the truly transformative before and after results from real patients of Dr. Mohr on Long Island. If you still have any questions or want to schedule your initial consultation, please contact our office today. Before you know it, your beautiful smile will be lighting up your face once again. 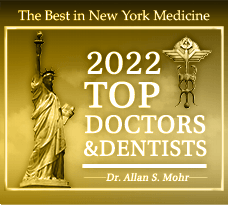 Dr. Allan S. Mohr is a graduate of the New York University College of Dentistry and has been practicing on Long Island since 1986. He has also studied at the prestigious Pankey Institute and the Dawson Academy, two of the most well-respected post-graduate education institutions in the world. Dr. Mohr has been dedicated to rebuilding smiles since his first day as a dental student, which is why he strives to continually educate himself and share all the information he can about dental implants. He truly believes they are a medical wonder, and he’s continually amazed by the fantastic results they can achieve for his patients. If you’d like to contact Dr. Mohr, he can be reached at his website at https://www.smilecreations4u.com, by phone at (516) 882-6635, or by e-mail at smilecreations4u@gmail.com.